If you are participating in the 2018 Kids Summer Reading Program and you don’t know what to read next, here are some reading suggestions. From his early years at Juilliard in the 1950s and composition training in Paris in the 1960s, Glass moves through his search for a guru in India and his later operatic compositions. Personal stories mix with his constant drive to create music that spurs an emotional response in listeners. Describes nineteen careers in the music field, with qualifications and duties for each job. Includes promotion, publicity, marketing, distribution, publishing, songwriting, and more. Profiles singers Mariah Carey, Gloria Estefan, Donna Summer, and Ace of Base. For junior and senior high and older readers. Surveys the lives and music of musicians who have made jazz the influential and enduring musical form of this century. Includes such artists as Scott Joplin, Leadbelly, Billy Holiday, Charlie Parker, and John Coltrane. Family listening guide to the evolution of rock music and subgenres, featuring artists such as Elvis Presley, the Supremes, Led Zeppelin, Queen, Blondie, and more. Provides historical background for each artist and group, and includes playlists, labs, and music-centered destinations for vacation ideas. Ethnomusicologist surveys world music in its full historical and modern diversity, ranging from folk and traditional music to Bartok. Sees both liberating prospect and denaturing peril in the phenomenon of globalization. Amid analytic passages, particular repertoires and musicians are examined–including Bob Marley and Nusrat Fateh Ali Khan. Also, honors collectors and scholars. Fifty-six essays profiling hundreds of female blues, jazz, gospel, country, and rock singers. Describes each music movement and includes discographies and a bibliography. A music critic and professor chronicles popular music in America, from the sheet music sold in the late 1800s, through the dawn of radio and music recording, to the music downloads of the modern day. More than just entertainment, he argues, pop music is a tool for social change. An American composer describes step by step how the layperson can become an active listener to music. Without downplaying the emotional appeal of music, he stresses the enhanced enjoyment that comes from understanding the organization of sounds. He describes the creative process, discusses the basic elements of music, explains musical forms, considers the role of the performer, and offers practical advice to the listener. Examines the origins and evolution of rap music, its African roots, and its continuing popularity throughout the world. Examines the “gangsta” image in hip-hop culture and the controversy surrounding some of its major artists, including female and white musicians. Political scientist examines the integration of music with political activism amongst Muslims. Focuses on hip-hop, jazz, and reggae in addition to regional genres. Profiles activists and musicians from the 1800s through the early twenty-first century. To download this list of see other reading suggestions click the link below! It’s that time of year again. 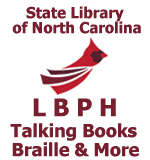 If you are a patron of NCLBPH and you haven’t registered for the 2018 Summer Reading Program, you may register in the link provided below. Be sure to register before the closing date! Reading Takes You Everywhere!!! This entry was posted in Adaptive Technology, Adults Summer Reading, BARD, collection, events, Reading Suggestions, resources, summer reading, talking books and tagged BARD, BARD Express, BARD Mobile, books, Digital Books, digital braille, download, educational, entertainment, fun, Kids Summer Reading, Kids Summer Reading Program, Libraries Rock, library, music, nc libraries, nclbph, North Carolina Library for the Blind and Physically Handicapped, reading, summer reading program, Talking Book Player, talking books. Bookmark the permalink.